Plurk — A way to keep a log of the great articles and sites that you've visited. It has a timeline. Your friends or total strangers can see your links. This is really new, but it may turn out to be my favorite. I didn't see a search function though. FriendFeed is another social networking link file. It finds links through delicious, twitter, facebook, craigslist, and other sources. I find this useful, because so many people come to my blog from these sources. I like to see what people are saying about me. I know that a lot of people are switching over to WordPress. I poked around a bit. It has some nice templates, but I thought they were harder to customize than the Typepad blogs. I've been playing around with TweetDeck to combine the status updates from Twitter and Facebook, but I don't love it. You can't read comments on your friends' status updates and have to log onto Facebook to reply. It is pretty looking though. TwitterUrly is useful for seeing what links are being through around Twitter. You can search for individual posts that you write, but you can't just plug in your blog and find all the links. Using a key word search in Twitter is more useful for that. Still, I do link knowing what people are talking about. It seems that Apple Tablet is the big thing today. 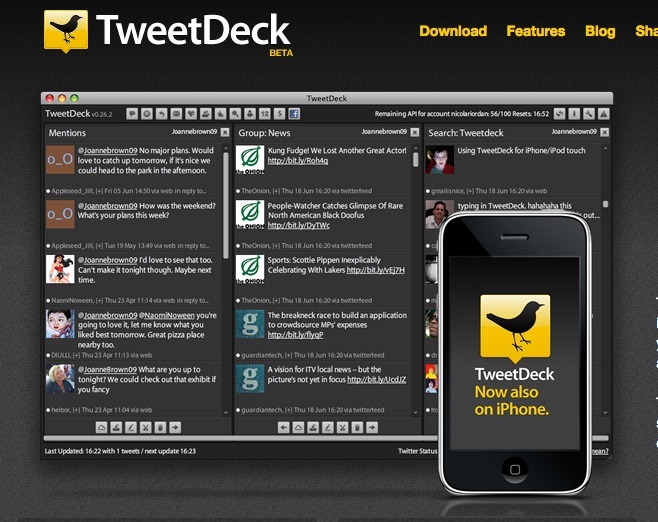 Big fan of tweetdeck. Built more for twitter management but they are coming with new updates all the time. Really like what they offer. I use WordPress and I love it. Customizing the visual look of blogs is not the hard, depending on what you want to do. if you want to change colors, fonts, etc you have to purchase the CSS upgrade ($15/year) and learn some basic CSS code. It’s pretty easy once you get the hang of it. If you want to just rearrange the basic layout of a blog page, that’s just drag and drop. I think they are a very user-friendly company and in the 18 months I’ve used them they have rolled out tons of extras for free. The only drawback I could see for Blogger or Typepad users is the lask of Google ads. But who really makes money off those anymore? I finally just took the Facebook feed out of my Tweetdeck. It was driving me crazy for some reason. I’ve used WordPress for a work-related blog and it’s been fine. Skims out the comment spam nicely.